The HPI 18S incorporates a single 18” driver designed with optimum X-mass for a partially horn loaded enclosure. The result is a full sub bass sound with very high transient attack. Ideally suited to high power applications, the high temperature 4” voice coil coupled with aerospace materials will retain its resonant properties for the life of the drive providing uniform frequency response regardless of age. The void free birch ply cabinet is available in scratch resistant painted finishes complete with heavy gauge steel front grill. Provision for rear mounted wheels makes the HPI-118 a versatile unit for mobile or permanent installation. The HPI 118SP includes a high current capacity low pass filter network featuring steep slope filter technology for performance unseen in conventional passive networks. 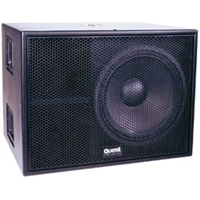 The HPI118 is ideal for live music and disco installations where big bass is required to cover a medium size venue space.